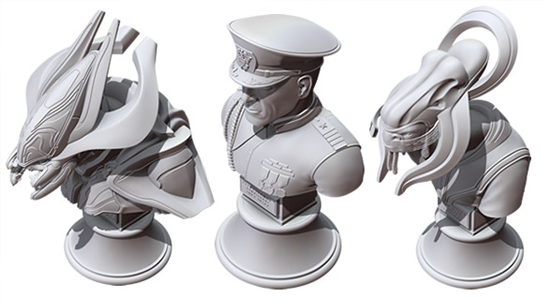 Our friends and partners at Spartan Games recently revealed collectible busts of some of the latest fleet commanders they’ve added to the fold. Showcased are Fleet Admiral Terrence Hood (or “Lord Hood” for the truly illuminated), the Minister of Etiology, and Xytan ‘Jar Wattinree in tip-top torso shape. The busts are designed to fit into a slick stylized base that conveniently houses their respective dice sets. Needless to say, it’s been a pleasure for to partner with Spartan Games on these replicas, working together with the talented folks across the proverbial pond to help ensure that the models are as accurate as possible, whether they are adding a premium level of style to your tabletop assault or just adorning your mantle. For a bit more info, check out Spartan Games’ blog post detailing the set, and start clearing new space on your shelf! This week we dropped “Battle of Shadow and Light,” our first foray into Halo 5: Guardians sustain content, featuring new maps, a new game mode, and new REQs to collect and deploy. 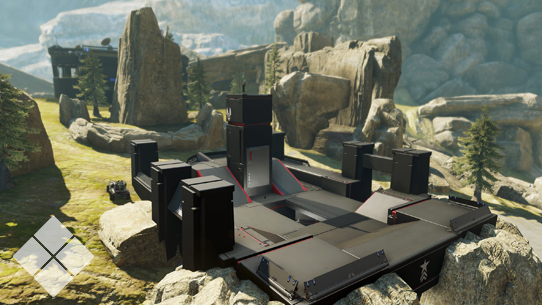 One of those maps – Basin – is a spiritual sibling to revered playspaces such as Blood Gulch and Valhalla. 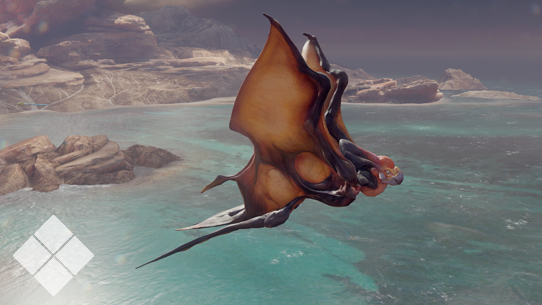 Basin is loosely based on one of the scattered ONI Research Facilities clustered together on Gamma Halo during the UNSC’s exploratory occupations of the ringworld in 2553, though now the site lives out a virtual purpose to hone the skills of the Spartan-IVs, doing its part to prepare the supersoldiers for the certain danger that lies ahead in the uncharted future forged by the Guardians’ awakening. Forerunner weapons are built atom-by-atom in nanofabrication forges of unsurpassed fidelity, following instructions spun into design seeds by skilled pattern-weavers assisted by ancilla. Had their creators wish it, every example of their craft could be perfectly identical down to the smallest detail and fractal core. Such perfection and symmetry of effort appealed to the Forerunners responsible for designing artifacts and edifices that wrapped the ecumene in layers of miraculous machinery that reshaped the galaxy to their whims. But repetition at such a vast scale held no appeal for the Warrior-Servants, those who dedicated their minds, bodies, and lives to the defense of the Forerunner people and its vast realm. When possible, the Warrior-Servants preferred to design and build their own unique panoply in cooperation with their warsworn brothers and sisters, crafting arms and armor as beautiful and inspiring as any sculpture or painting. The highest order of Warrior-Servants, the Prometheans, were particularly renowned for the quality of their master-crafted equipment, and the deadly genius of their pattern-weavers. However, the desperate war against the Flood allowed for no beauty, no elegance, only the music produced by lances of crystalized light and the brilliance of burning mountains of corrupted flesh. No songs were sung by these Warrior-Servants of bravery, of victory, of hopes for a tomorrow. There was no tactical finesse to be wielded against the infection, no favor or promise that could turn the Gravemind from its purpose, no stratagem that could withstand its cold calculation. As millions of dead Forerunner warriors turned into billions, then trillions, the wicked and graceful weapons and armors of the old Forerunner guardians were ground into the dirt, crushed underfoot, and then erased from all memory with the unravelling of the Domain. All that followed were sterile, efficient instruments of death without any beauty. In the desperate fight against the Flood there was only time for survival and duty, not art. Against the chilling sterility of unremembered assemblies however, beacons of exquisite exception were still to be found. 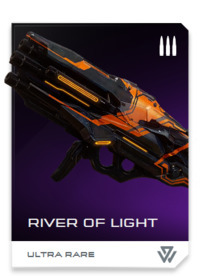 The River of Light is one such example, having returned to history after being unearthed in a Promethean cache in a grand factory that had once spun impossible miracles of exotic matter. Its forges had lain cold and abandoned for a hundred thousand years before the Warden Eternal returned with writs of control, dominance, and resurgence. One of the first Incineration Cannons ever made, the River’s core had been built and refined over decades by an unknown Promethean who served with distinction and honor in dozens of containment operations. The cannon's harmonious energies burned uncounted fetid burrows to ash and toppled grand spore towers dedicated to the parasite. In the dead hands of a Knight the River of Light’s true potential could never be unlocked, but the artifact’s heart knows its name and purpose, and hungers to be remembered once more by warriors whose hearts pump with life and limbs move with purpose and intent. Don’t forget that next week, Halo: Escalation concludes with Part 6 of the Absolute Record storyline. At the cusp of potentially achieving a technological tipping point for humanity, Dr. Catherine Halsey makes a final, defiant stand against Spartan Commander Palmer in the explosive conclusion by Duffy Boudreau and Douglas Franchin. 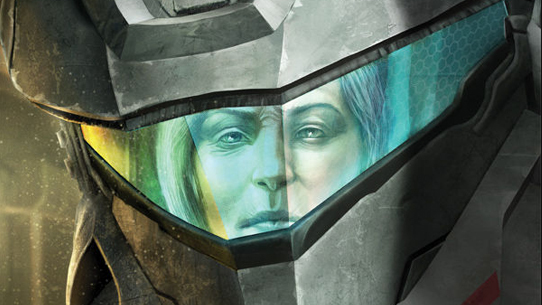 Halo: Escalation #24 drops November 25th, but you can check out the preview right here and right now. Give it a look! And with that, we close for this issue. Hopefully you have a fantastic weekend and we hope to see you back with us again next time! 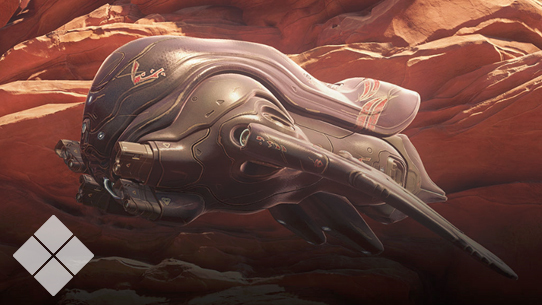 Until next week… Live well, play Halo, and never get between a Spartan-smitten Elite and his object of affection. Attempting to unlock mysteries of the war, Fathom Station was commissioned to research the Covenant’s Splendid Intention. 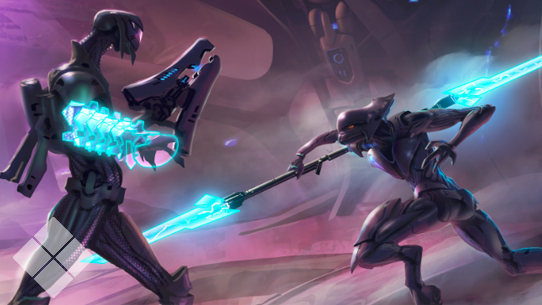 This week in Canon Fodder, we give you a taste of the upcoming novel by Joseph Staten, Halo: Shadow of Intent, plus a remastered recap of a Long Road Home.